No visit to Rome is complete without a visit to Vatican City. This small, self-contained state which lies just west of the Tiber River welcomes millions of pilgrims and visitors each year. 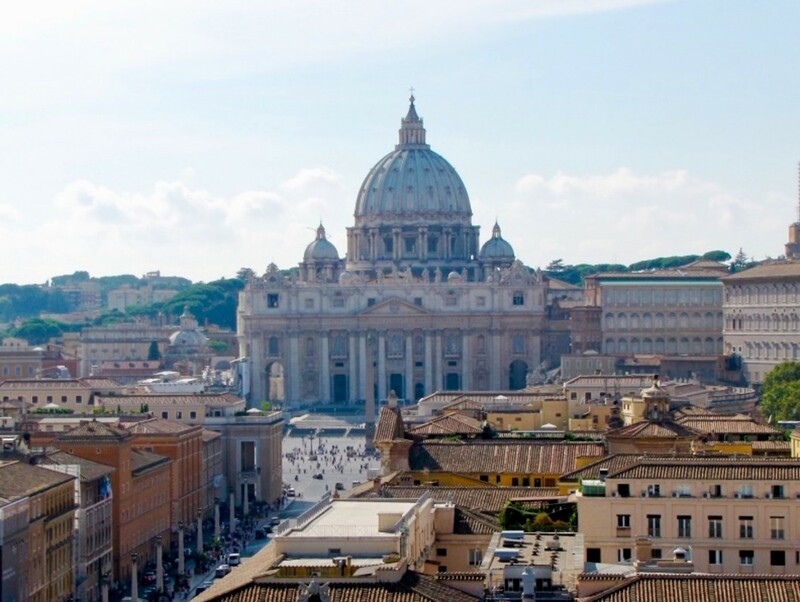 While most people will visit the obvious sites like St Peter’s Basilica, the Vatican Museum, and the Sistine Chapel, there is much more to see and do while you are here. I've listed ten things worth seeing and doing while visiting Vatican City. Hopefully, you’ll get a chance to experience some of these on your next visit to Rome. 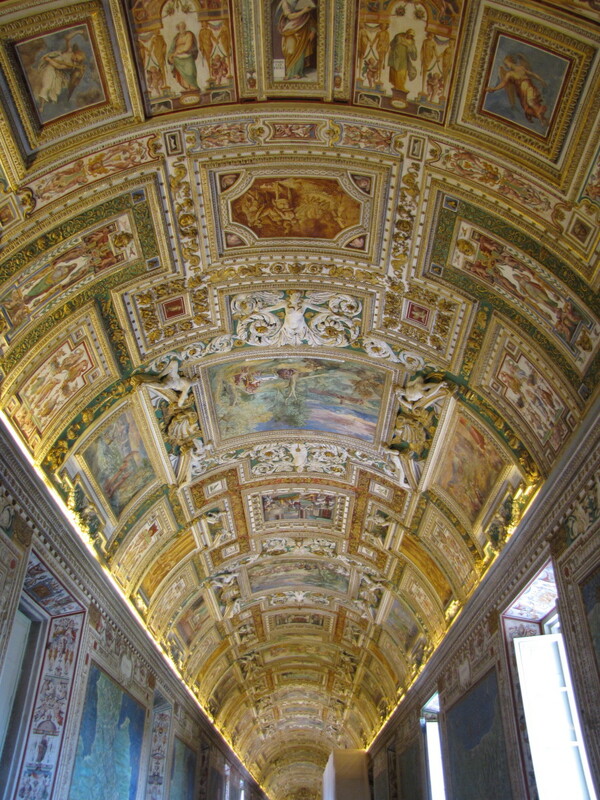 The Vatican Museums, all thirteen of them, are considered to be among the world’s finest museums. Housing many of the most renowned paintings, sculptures, and art, these masterpieces have been collected by popes for over many centuries. Visiting the museum can be a daunting task, and you would be wise to consider a tour guide when visiting in order to decipher all that the museums have to offer. The fee to enter the museums is a very reasonable 15 euro. Tickets can also be purchased ahead of time online for an additional 4 euro reservation fee which is referred to as the “skip the line” fee. 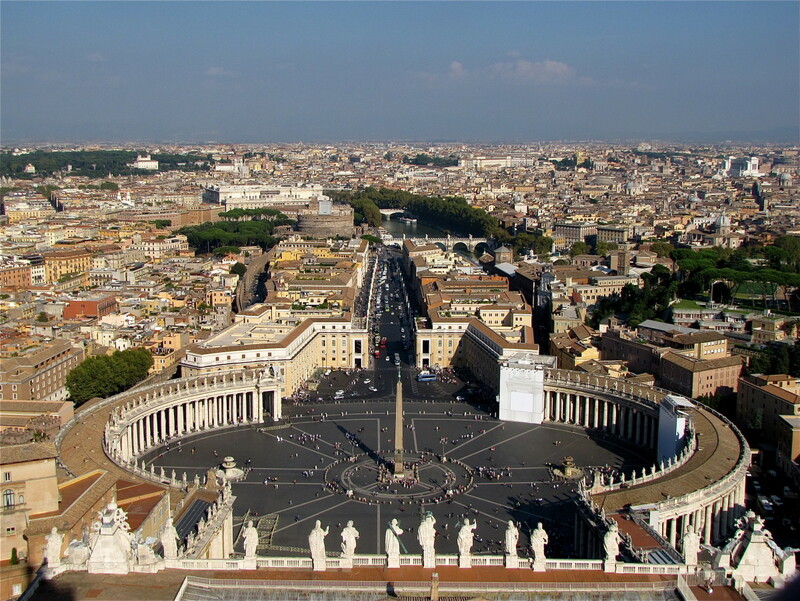 What many people do not realize is that the entrance to the Vatican Museum is not located in St Peters Square but rather is a good 10 to 15-minute walk to the right around the perimeter of Vatican City. On busy days you will be glad that you spent the extra 4 euro as the lines will often extend for quite a ways along this perimeter. 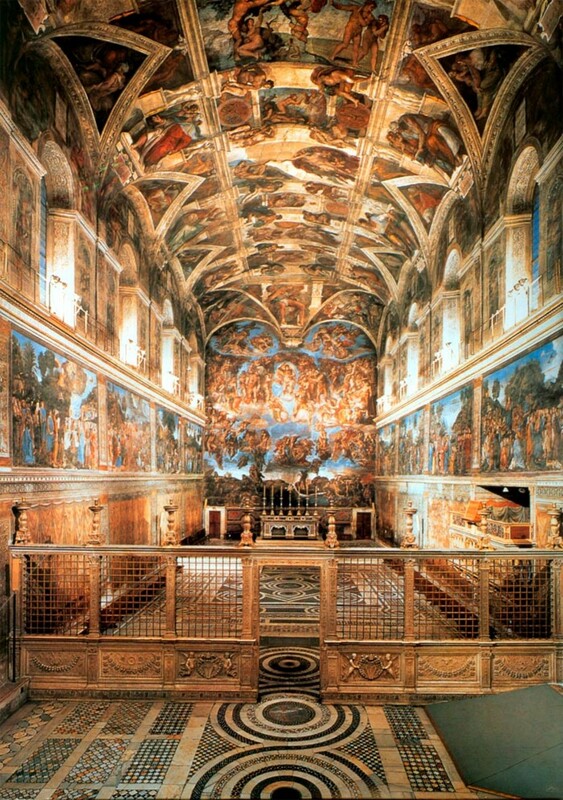 After touring the Vatican Museum you will come to the Sistine Chapel. On both of our visits to the Sistine Chapel, it was very crowded. The Chapel is not large and once people get inside they tend to not want to leave. The Sistine Chapel is certainly a sight to behold. Michelangelo’s famous Sistine Ceiling depicting scenes from Genesis and his The Last Judgment on the end wall are stunning. Before you leave, make sure you check out the side walls containing frescoes by Botticelli, Perugino, Rosselli, and others. The lower side walls contain numerous tapestries by Raphael. Be forewarned that if you try to take pictures inside the chapel you will most certainly be scolded by the museum authorities if you get caught. St Peter’s Basilica is open to the public free of charge. Before entering, you will have to go through a security screening and be advised that there is a dress code that must be adhered to. The first thing you will notice upon entering the Basilica is that it's enormous. Make sure you spend plenty of time here as there is a lot to see. 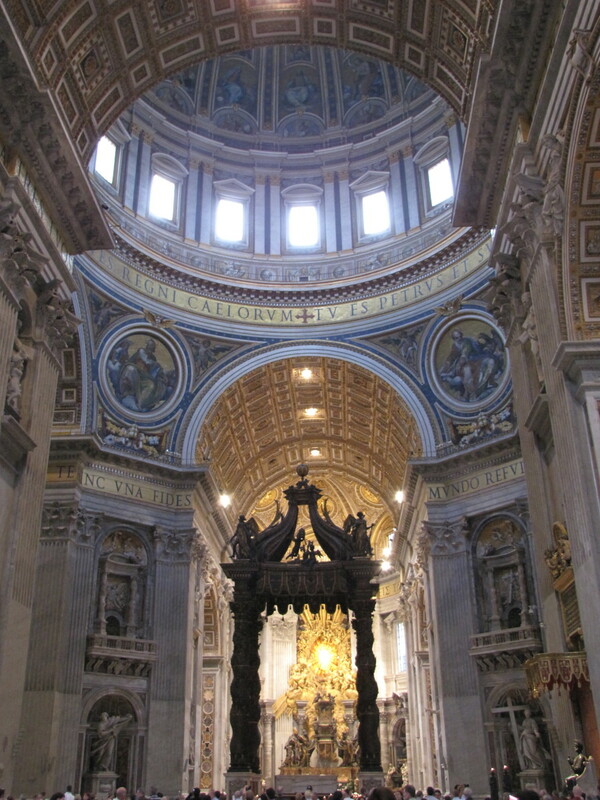 The Bernini designed bronze sculpted canopy over the high altar where only the Pope celebrates mass is beautiful and dominates the center of the Basilica. This altar, which is directly underneath the Dome of St Peter’s, was constructed directly above the ancient tomb of St Peter. More on this later when we talk about the Scavi Tour. 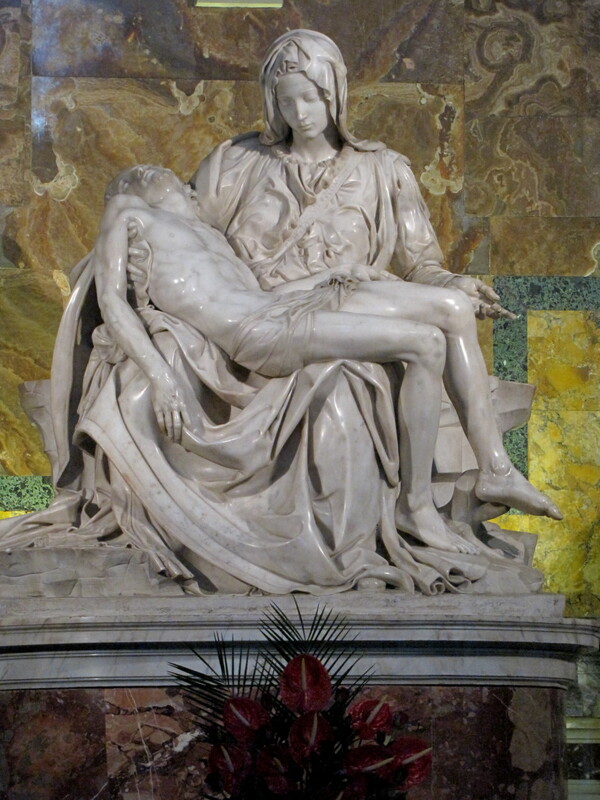 Before leaving the Basilica, be sure to stop and see Michelangelo’s Pieta, which is considered to be one of his greatest masterpieces. Located directly in front of St. Peter’s Basilica in Vatican City, is the monumental Piazza of St. Peter which was designed by Lorenzo Bernini. While there is much to see in the square itself, it is also a great spot to just sit and people watch as you take in the marvels of this important gathering place. Of particular note in the square are the Colonnades and Statues, the matching Bernini Fountains, the Obelisk, and of course the Papal Apartment which is visible up and to the right. The Papal Audiences are held on Wednesday mornings at 10:30 AM either in St. Peter's Square or in the Pope Paul VI Audience Hall. 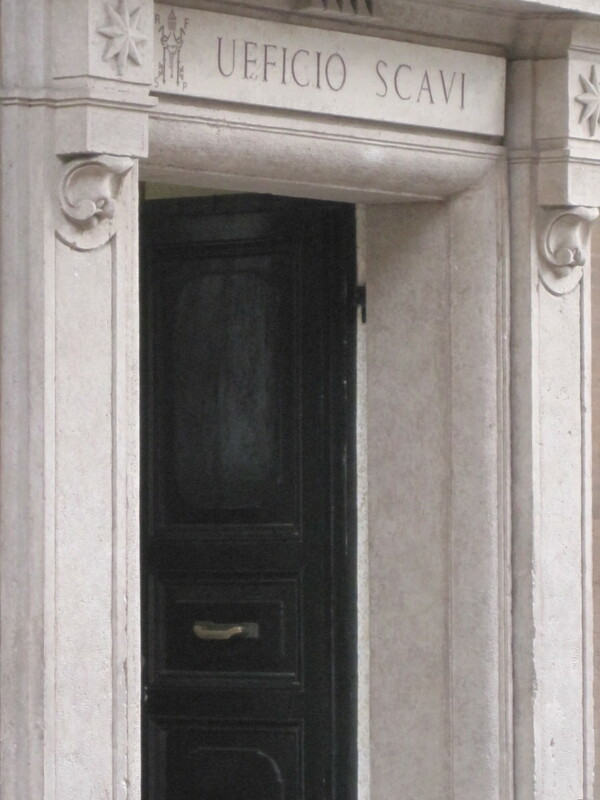 In order to get tickets to the Papal Audience, you will need to make your request in writing or by fax to the Prefecture of the Papal Household. Tickets are free and need to be picked up either on the day prior to the audience or on the morning of. If you happen to be in Rome on a Wednesday and if the Papal Audience is going to take place, you will not be disappointed as this is quite a spectacle to behold. 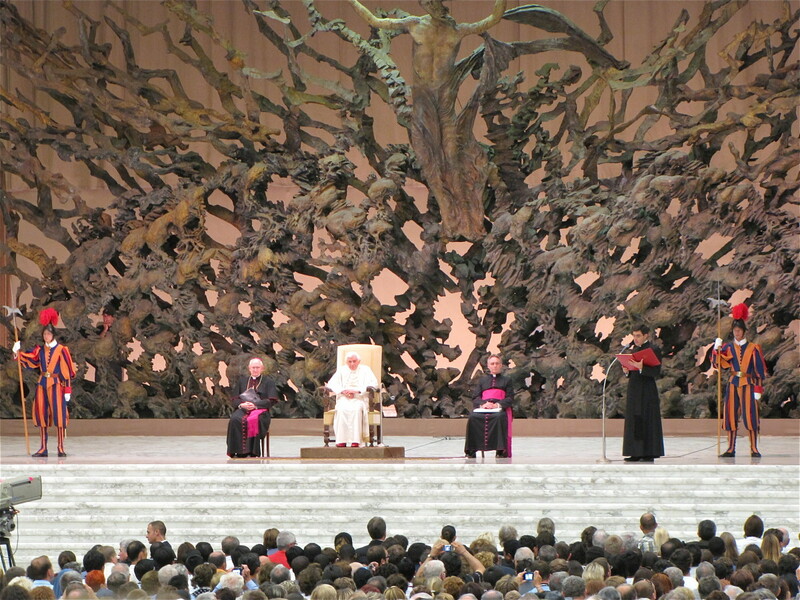 When we attended, the Audience was held inside the Papal Hall and the atmosphere was something akin to a sporting event. There was singing and dancing by people from all over the world who came dressed in their native garb. Flags were waving and there were spontaneous eruptions of song and mucic, it was quite a morning. On our second trip to Rome and the Vatican, we decided to try to attend a mass in St Peter’s Basilica. There are many masses daily and attending one is an experience that you won’t want to miss. Before entering the area where the mass was being held we were warned by the Vatican security that this is a mass and not a photo opportunity for tourists, so please show the due respect when attending a mass here. There are many altars in St Peter's Basilica and the mass we attended was in the impressive Apse located in the back of the Basilica. 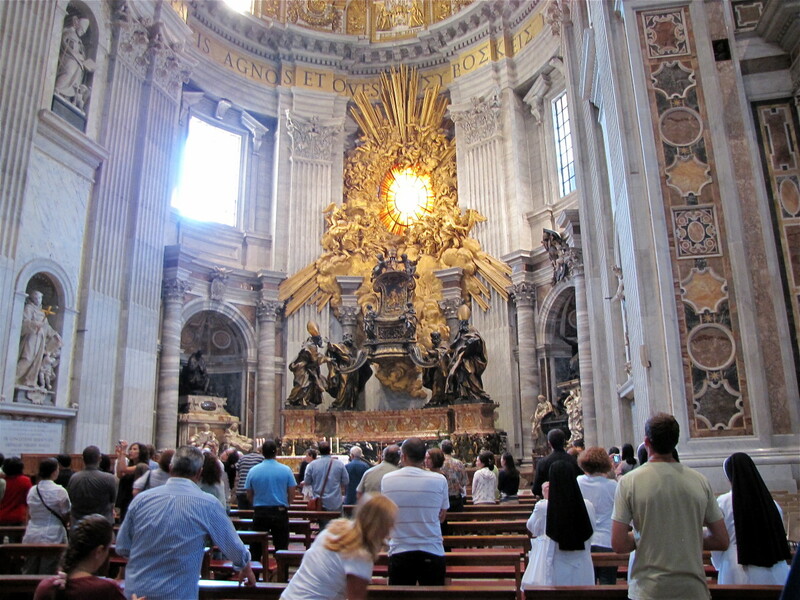 The Papal altar located under Bernini's Canopy is only used for masses given by the Pope. 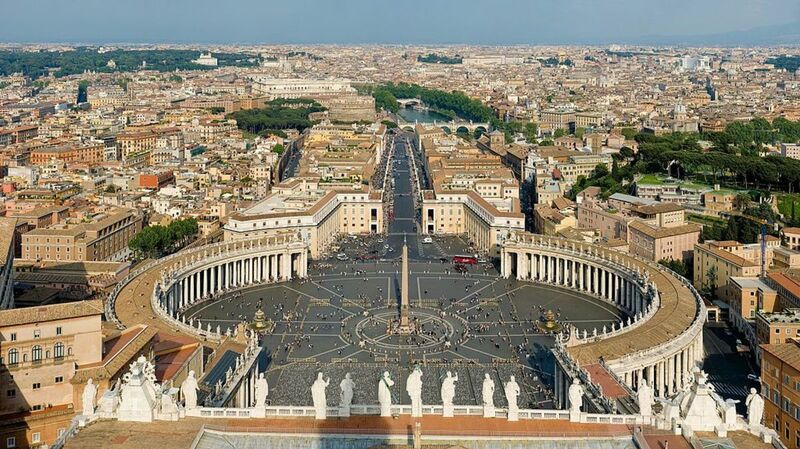 If you are looking for a great view of St Peters Square and of Rome then the Cupola is the spot for you. Being the highest point in Rome the Cupola offers great views in all directions. It costs 7 euro to take the elevator and 6 euro for the chance to climb the 320 stairs. The elevator only takes you to the roof of the Basilica so you will still need to climb the rest of the way to reach the Cupola. If you’re not into climbing you can hang out on the roof which still offers wonderful views. At the entrance to the Basilica, there is a sign that directs you to the far right of the portico (past the Holy Door) and to the kiosk for the elevator. After visiting the Basilica, don't miss the chance to visit the Sacred Grottoes or Crypt where the tombs of many popes and other dignitaries are interred. 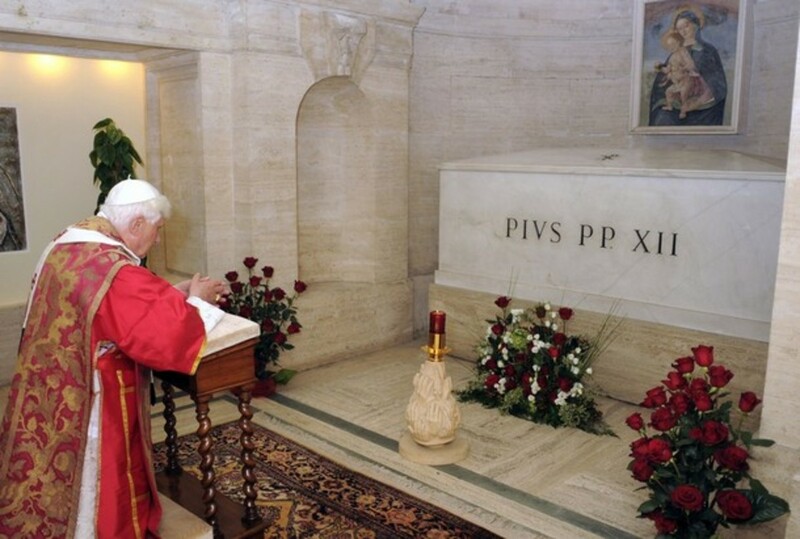 The Crypt lies beneath the church and contained the tomb of John Paul II up until his beatification in May of 2011. At the end of the Crypt lies a glass wall which offers a view down to the tomb of St Peter which is located directly below the Papal Altar. One of the most interesting things that we did while visiting the Vatican was to take what is known as the Scavi Tour. This tour takes you down below the Crypt to an area known as the Necropolis and the site of what is believed to be St. Peter’s tomb. 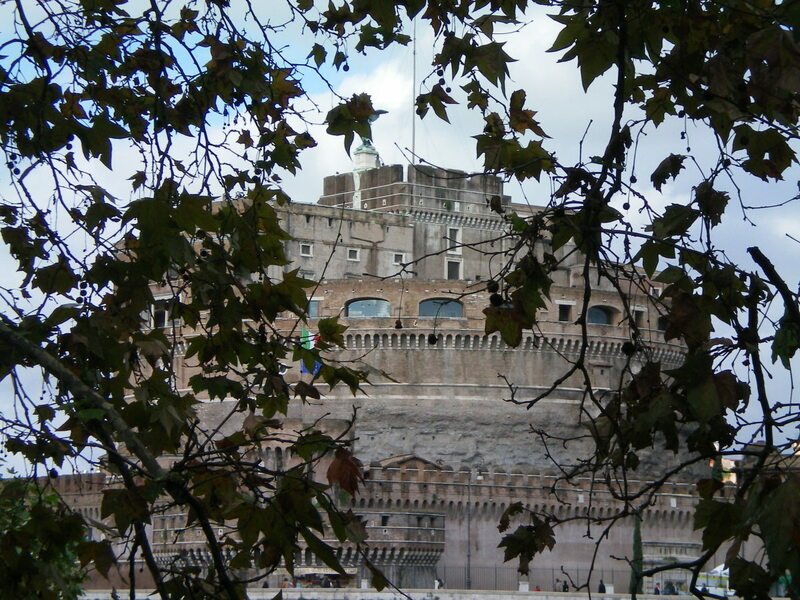 This tour requires reservations which should be made many months in advance as the Vatican only allows about 200 people per day to go down there. Tours start at 9 am, are limited to groups of no more than 12-15 people, and cost 12 euro. Please be advised that this area is very warm and humid and is in the original excavated condition. If you are at all claustrophobic you might consider skipping this tour. 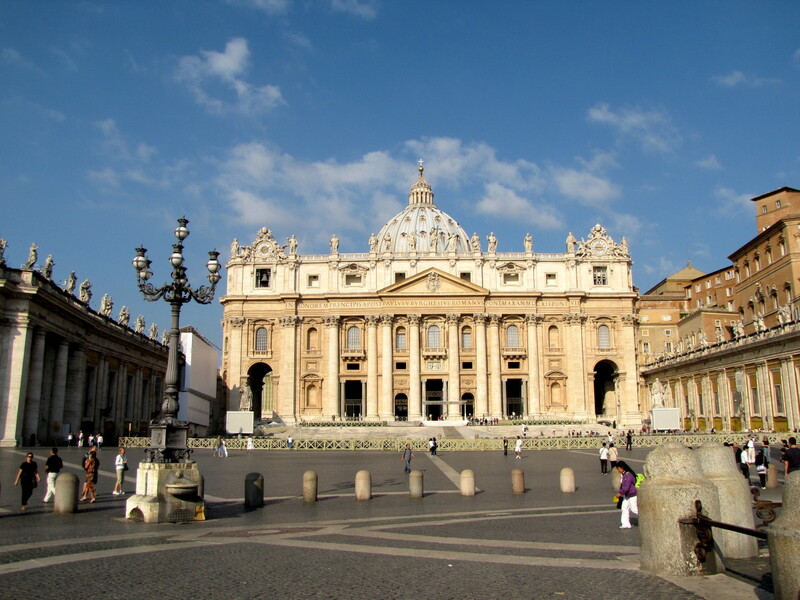 We found this tour to be fascinating and one of the highlights of our visit to the Vatican. 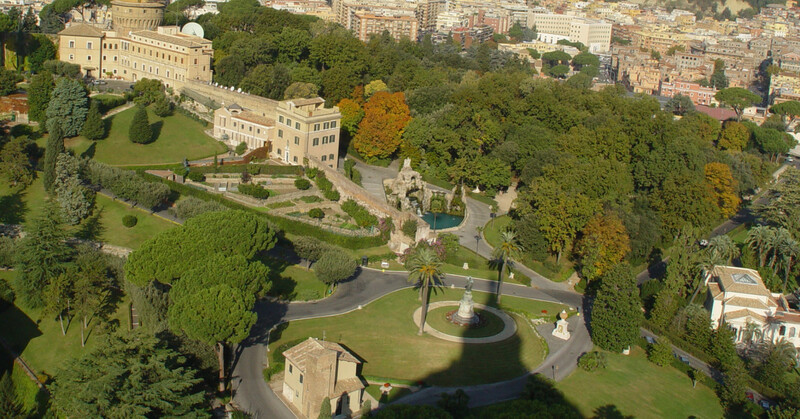 The Vatican Gardens cover over half of the land occupied by Vatican City and are located behind St Peters Basilica. The only way to see the gardens is to arrange a guided tour through the Vatican as they do not allow people to wander unattended through the gardens. 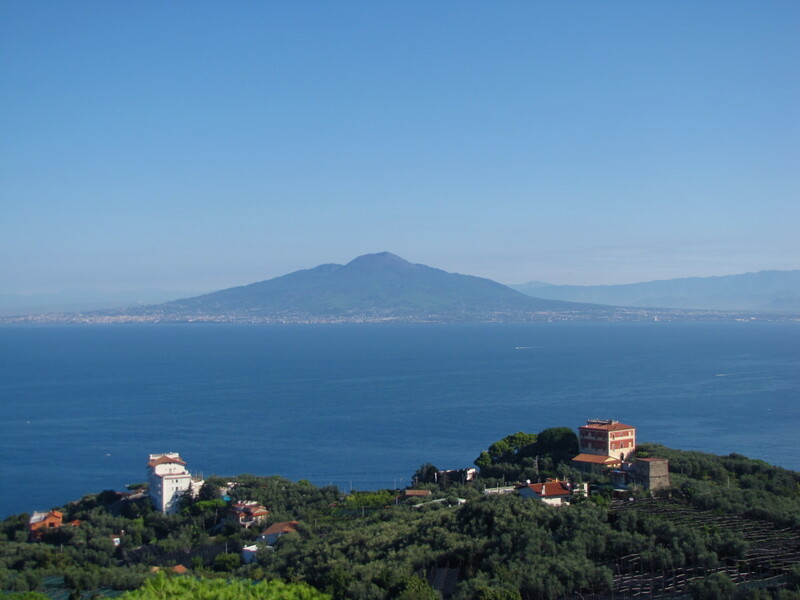 The cost of this tour is 31 euro and includes the guided tour of the gardens, entrance to the Vatican Museums without a guide, and the rental of audio guides. 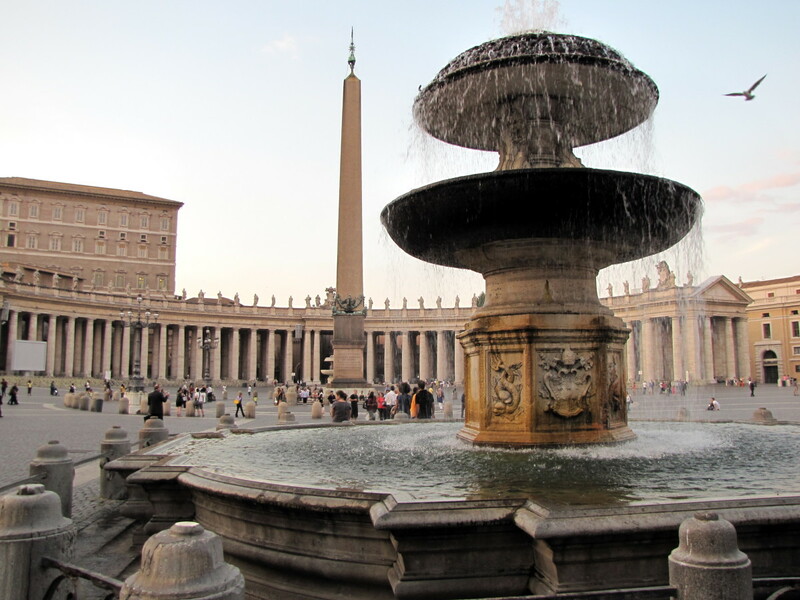 What is your favorite thing to do in Vatican City? How many days would it take to cover everything mentioned in your "Top 10 Things to Do in Vatican City" article? At least two to three days. 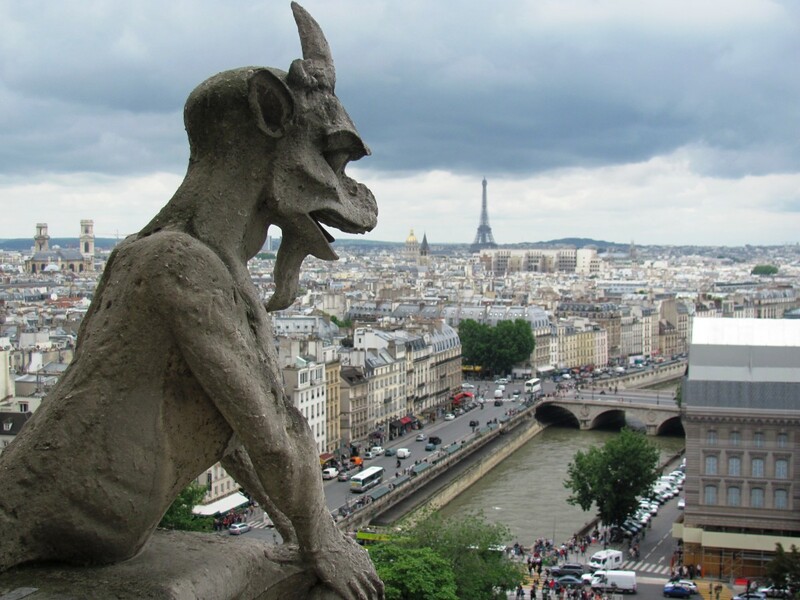 Of course, this will depend on how much time you spend in the museum, the cathedral, gardens, in the square, etc. Also, if you get tickets to a Scavi tour and a Papal Audience, this will require extra time waiting and going through security. To do it all without rushing it would take a good couple of days. Good luck, it’s an amazing place. Thank you Ofer. Great advice. 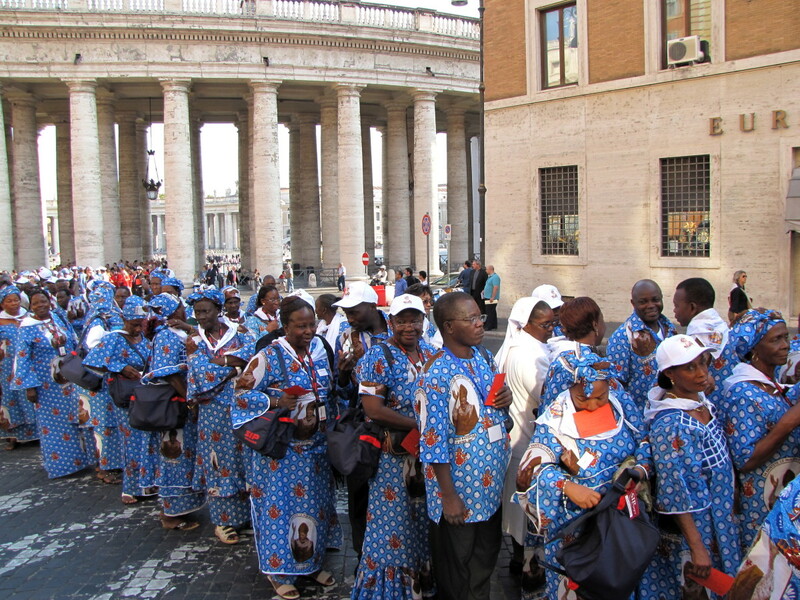 1) Reserve all Vatican tickets in advance, otherwise the lines are long as you wrote. 2) Get the audio guide in the Vatican Museum, the audio guides have long, interesting explanations. Vatican Museum + Vatican Gardens + Train & tour of the Pope's summer residence by the lake + return train to Rome. Book in the Vatican's website. Thank you Maria. It was all amazing for us to see also. Such a special place and we look forward to returning in the near future. Hang on to that statuette, it’s priceless. Makes me feel good to see the pictures of the Vatican. Even if I had been there 3 times, I still can't help but marvel at the things I have seen and see others I have not really looked at or done. Hi CYong74. The Grotto and the Necropolis are certainly a must see. The Vatican is an amazing place and we look forward to returning soon. Thanks for stopping by and have a great day. The Sacred Grotto is a definite must. A tad difficult to arrange. But it's what most Vatican City visitors don't get to see and experience. Hi Robert. Thanks for stopping by, glad you enjoyed the tour. This was a great article. Hope to go there soon. Hey KDuBarry03. It certainly is amazing. The Vatican is an unbelievable place. The art, the architecture, the history, simply amazing. I'm sure you'll get to experience it all some day. Thank you for reading and the comments, much appreciated. 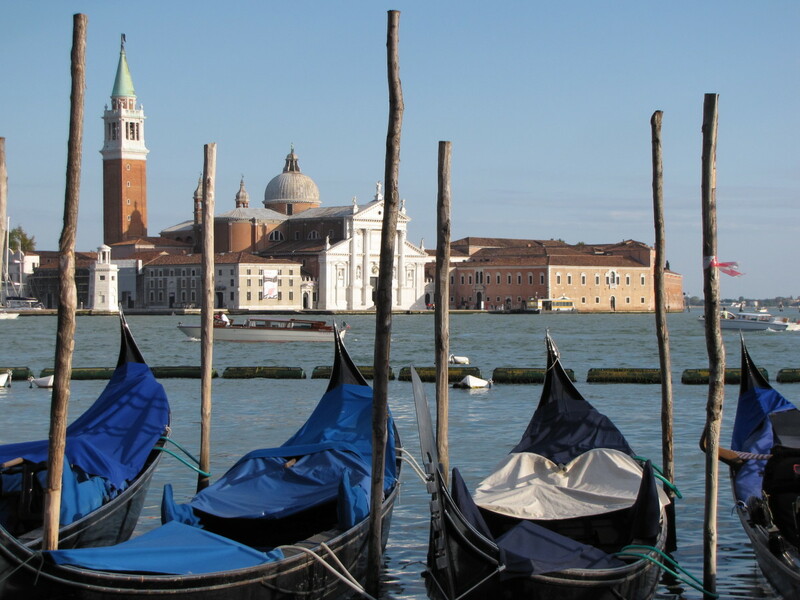 Another must visit destination in Italy. There is so much to see just in Vatican City alone. Thanks for stopping by. Thanks Robert for a great and informative hub and great photos of the Vatican. 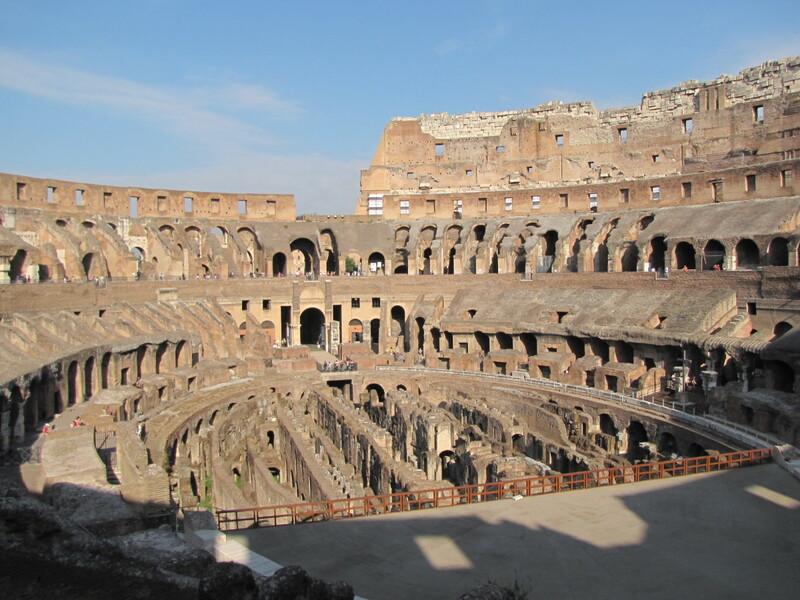 I was there in 2010 but only took the guided tour provided by our cruise ship. There certainly is much more to see beyond the basic tour!! Thanks Robert. Appreciate the vote and share. The world is a big place, so much to see and experience. This is a great article bdegiulio! You have traveled the world and documented it much better than I have. I appreciate your comments on my hubs - you are hilarious. I look forward to reading and learning from more of your articles! Stay classy good sir. Thank You megni. 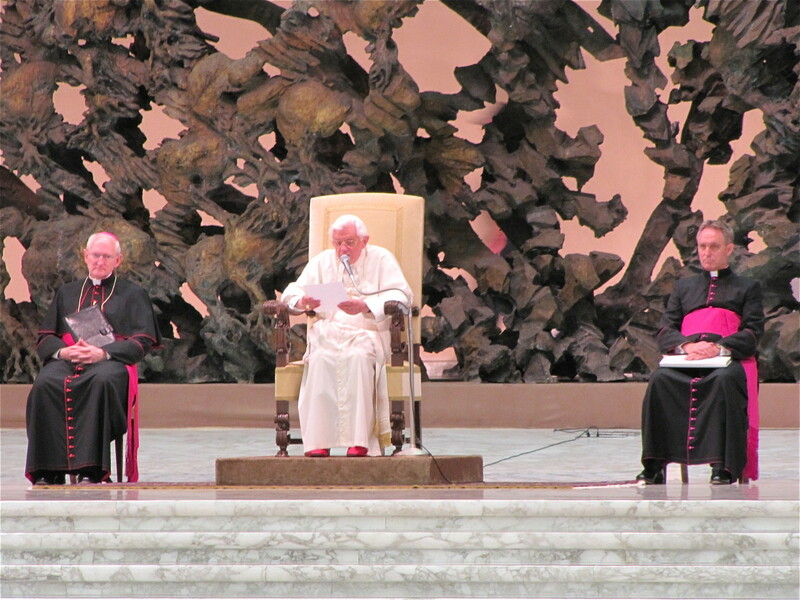 One of the highlights of our last visit to Rome was attending the Wednesday Papal address at the Vatican. It was an amazing event. very much appreciate the comments. Great information and very helpful. I've never been to Rome but I am admirer who likes to learn. I often swith my TV to EwTN and frequently get glimpses of the Pope giving his Wednesday messages. Thanks for sharing. Wonderful pictures & very informative voted up & beautiful!